Inspection tours made by top Chinese leaders at the beginning of the year have signaled key messages about China's latest focus of its governance and strategies, observers said on Monday, as Chinese President Xi Jinping finished his first inspection tour of 2019 across the Beijing-Tianjin-Hebei region. Xi has urged more efforts to achieve new, greater progress in the coordinated development of the Beijing-Tianjin-Hebei region. 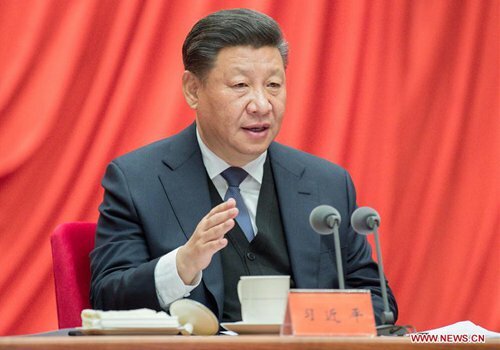 Xi, also general secretary of the Communist Party of China (CPC) Central Committee and chairman of the Central Military Commission, made his remarks during an inspection tour of the region from Wednesday to Friday, the Xinhua News Agency reported on Friday. Regional integration is a crucial strategy to solve the problem of uneven development among different areas of a region, Xu Xing, a professor of politics at the Zhou Enlai School of Government of Nankai University in Tianjin, said on Monday. "The first inspection tour of 2019 showed that promoting regional integration would be a focus of China's domestic governance," Xu noted. This strategy is about creating infrastructure to connect different areas in a region in order to boost cooperation, interdependency and collective development within the region. This is not the case only in the Beijing-Tianjin-Hebei region, as in South China's Guangdong Province there is also a similar strategy, the Guangdong-Hong Kong-Macao Greater Bay Area. On Wednesday morning, Xi visited the exhibition center for the planning of the Xiongan New Area in Hebei Province. There, he stressed that the creation of Xiongan is "a strategy that will have lasting importance for the millennium." The CPC's flagship newspaper People's Daily published an article about Xi's latest inspection tour on its Sunday front page, titled "A project with historic meaning." The article asserted that uneven development is a long-standing challenge which the country needs to resolve with great foresight and determination. During his tour, Xi also visited Tianjin and Tongzhou, a sub-center of Beijing Municipality. The inspection tour is a long-standing tradition and a regular activity for officials. "No investigation, no right to speak" is a famous quote from the founding father of the Peoples' Republic of China Mao Zedong, given as he made remarks in May 1930 to criticize doctrinism among the Chinese Workers' and Peasants' Red Army, according to people.com.cn. In Chinese, the word "inspection" consists of two characters: investigation and research. This means that everyone from the top leaders of the country to lower-level officials needs to keep studying updated situations and dynamics in the regions under their governance, and this is the basis of policymaking, observers of Chinese politics stated. The inspection is also intended to deliver the latest signals about the focus and priorities of government work and development from the higher levels to lower levels - authorities as well as private sectors and ordinary people, they noted. Zhang Weiwei, director of the China Institute at Fudan University, told the Global Times on Monday that "the first inspection tour of each year normally expresses a determination to achieve goals concerning specific issues within a year or sometimes longer. For instance, the construction of the Xiongan New Area is impossible to accomplish in one year." In December 2012, Xi picked Shenzhen, South China's Guangdong Province, as the destination of his first inspection tour outside Beijing after he became the general secretary of the CPC Central Committee. Shenzhen is a pioneer city of opening-up and subsequent reform. The selection of Shenzhen announced the new leadership's determination of further pushing reform and the opening-up in the new term, Zhang said. Not only Xi, but other members of the Standing Committee of the Political Bureau of the CPC Central Committee have also made their inspection tours in different regions. China is a country with vast territory and the world's largest population, together with complex national conditions, meaning its leaders are unable to keep updated with national situations by remaining only in Beijing and listening to reports from local governments, Zhang noted. "The inspection tour is truly essential for the country's governance." Not only advanced and developed regions like Shenzhen and the Beijing-Tianjin-Hebei region are destinations for inspection tours. Undeveloped parts of the country were also inspected, said Zhang, so that leaders can comprehensively and objectively learn the latest situations and dynamics of the country as a whole. According to people.com.cn, Xi's first annual inspection tours after the 18th National Congress of the CPC, from 2013 to 2019, have covered regions including undeveloped villages in Gansu, Shanxi and Hebei Provinces, autonomous regions for ethnic minorities such as Inner Mongolia, Ludian county in Southwest China's Yunnan Province where there was an earthquake in 2014, and Jinggangshan, a holy land of China's revolution located in Jiangxi Province. This series of inspection tours has delivered a comprehensive message over the past few years. They have shown a determination to succeed in an anti-poverty campaign, to rebuild regions destroyed by natural disasters, to boost unity amongst different ethnicities in China, and to inherit revolutionary traditions from the founding fathers of the country, the Party and the army, said Xu. From Xi's New Year inspection tours since 2013, observers have summarized that some issues are constant. For instance, the care for the livelihoods of ordinary people is always a concern, as visiting these homes is a routine itinerary during his tours. Stressing the importance of poverty alleviation is also a frequent topic. Due to the different situations that China has encountered over various years, main messages which individual inspection tours release are also different. The 2017 visit to Zhangjiakou, for example, was to inspect the preparation work for the 2022 Winter Olympics. When the Chinese economy is facing a challenge or slowdown, inspection tours focus on economic development to boost confidence, observers noted.